Czech composer, musical theorist, folklorist, music writer and teacher. Born July 3, 1854 in Hukvaldy, Moravia (former Austrian Empire), died August 12, 1928 in Ostrava (former Czechoslovakia). He was inspired by Moravian and all Slavic folk music to create an original, modern musical style. Until 1895 he devoted himself mainly to folkloristic research and his early musical output was influenced by contemporaries such as Antonín Dvořák. His later, mature works incorporate his earlier studies of national folk music in a modern, original synthesis. 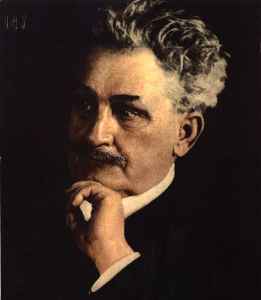 Janáček’s later works include the symphonic poem Sinfonietta, the oratorial Glagolitic Mass, the rhapsody Taras Bulba, string quartets, other chamber works and many original operas.